Form Description: Yard sales are inherently chaotic events that require a lot of careful planning to pull off properly. 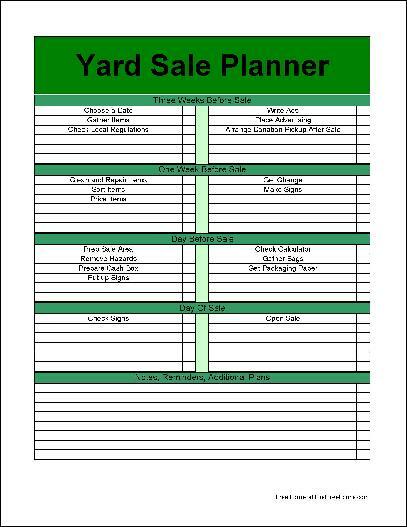 Use this Colorful Yard Sale Planner to not only bring some order to your next yard sale, but also make it as successful as possible. This planner is also able to work as a checklist, which will ensure that you know when something has been completed or not. Best of all, this form also has space which will allow you to customize it to your specific plans. All in all, this is the perfect yard sale planner. This form ("Basic Colorful Yard Sale Planner ") is associated with the following keywords: Miscellaneous, yard sale, money, family, financial, colorful, basic.